How cheap is it to make your own baked beans? Is convenience food as cheap as you think it is really? Does it give more or less nutritional benefits? I’ve done a bit of investigation so you don’t have to. Baked beans, possibly one of the older types of convenience foods on the market. You could say that it’s a staple in many store cupboards around the world. Personally I’m not a huge fan, I much prefer my own, homemade version with cannelloni beans as opposed to the classic flageolet beans that would normally go into a tin. Every 2 weeks or so I make this recipe but the chat recently about the cost and value of convenience foods has had me thinking so not only do I have a recipe for you today, but I also have a little cost/benefit analysis of the differences and similarities between the two. This recipe makes 16 individual portions so I jar the baked beans and keep them in the fridge. Homemade baked beans are brilliant weaning food. The 1-year-old loves to pick out the beans one by one and chomp on them with bright white teeth. He saves the carrot pieces with their natural sweetness until last, relishing each bite. Soak your dried beans in water the night (500ml) before you intend to make this recipe. Make sure they are well covered and leave them to one side. Peel and roughly chop the onions, garlic and carrot. In a large saucepan (with a lid), heat the sunflower oil on a low heat then add the onions and garlic. Stir until coated with the oil and then cook for 10 minutes, stirring every now and again. Make sure the saucepan doesn’t get too hot. If it does then decrease the heat. After 10 minutes add the tomato puree and carrots. Stir until all the vegetables are well coated. Strain the remaining water from the beans. Pour in the beans, tinned tomatoes, water and Worcester sauce. Bring to a simmer. Reduce the heat to very low, cover the saucepan and cook on low for 2 hours. Place into sterilised jars and leave to cool before covering. The baked beans will keep for up to 3 weeks in the fridge if you don’t eat them first. Now to the analysis. I’ll let you draw your own conclusions. 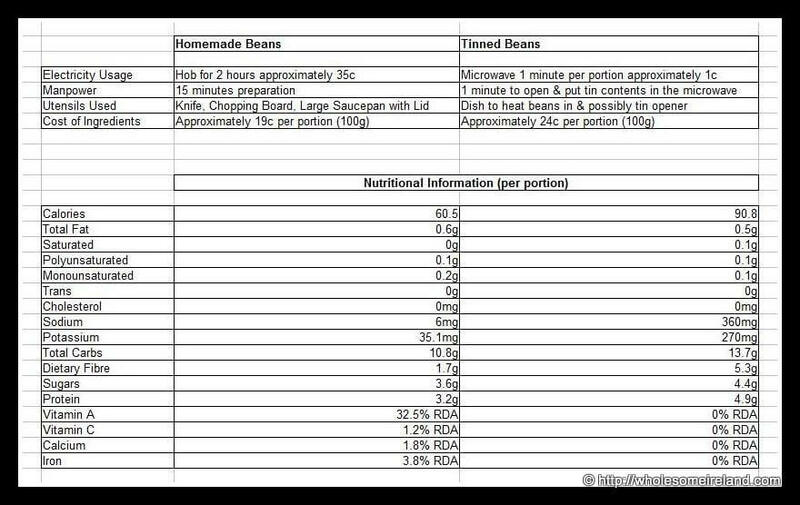 I used the prices as of today in my local supermarket to calculate the cost of both the tin of baked beans and my normal ingredients. I’m assuming that you have had to buy every single ingredient new when costing the recipe. During the summer, as we grow many of the ingredients within the recipe at home, the cost of vegetables to us decreases, making my homemade version significantly cheaper than the prices shown here. There are also economies in scale so if you buy a bag of budget carrots for example, the cost per item is reduced. Allowing for the electricity usage, each portion of my own recipe costs 22c to bring to the table (rounded up to the nearest cent) and the convenience option costs 25c. The only item I haven’t factored into the calculations is the value of your time as it’s so subjective. I could not have compiled this blogpost without the Myfitnesspal app & website, That is how I have scanned the barcode from the popular premium tin of baked beans to obtain their standard values and also how I calculated the nutritional values for my recipe. I used the Electric Ireland Appliance Calculator to figure out the cost of the energy used to cook both options. They also have an app available for iOS and Android. I highly recommend this calculator if you’re trying to reduce your energy costs at home. I have no affiliation to them, in fact I’m not even a customer! If you would like to hear why I don’t like baked beans from a tin then click the recording below to play my audio. Oh definitely far too sweet I agree. As space is at a premium here pressure cookers and slow cookers aren’t an option but I’m sure they make all the difference. When kitchen was cupboard sized and fuel was shilling in the meter pressure cooker was about my only saucepan. I have tried your recipe for the baked beans and they are really yummy. I am not a fan of the tinned variety, these taste so good and wholesome, thank you for sharing the recipe. Doris I’m delighted you like them. Enjoy. Hi Jane yes that figure is correct however I can’t figure out how the manufacturer gets a higher number! Pingback: Master Budget Shopping with Wholesome Ireland and the Super Savers!